Lovely Little Tulips is a quilt block pattern that's perfect for scrap quilt fans but just as pretty when a group of the quilt blocks is sewn together using a limited range of colors. 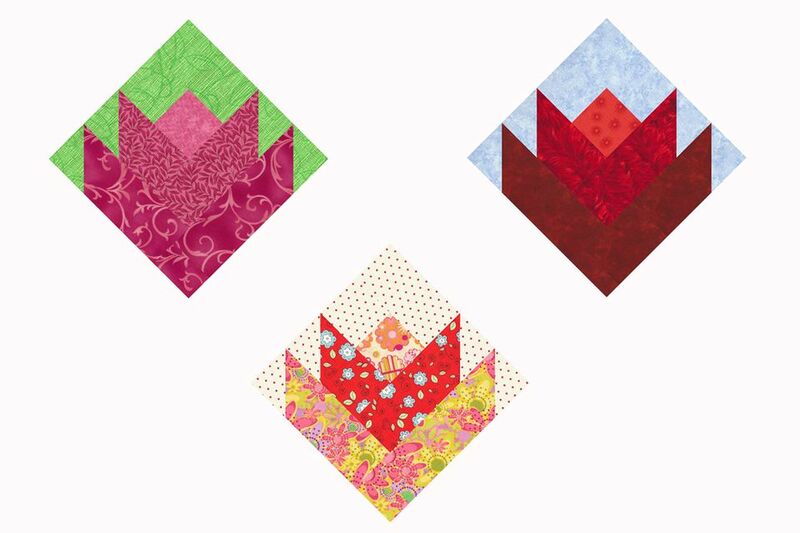 The three examples on this page illustrate a few of the different looks that can be created with the little tulip quilt blocks. I've shown the blocks on point but you can arrange them in a straight (horizontal) setting if you prefer. This version of a little tulip design is very much like a log cabin quilt block. The block can represent several flower types. For another type of tulip, take a look at my 9" tulip quilt block pattern, with a flower in each corner of the block. The corners are separated by sashing and a small square sits at each block's center. The tulips finish at 8" x 8" and are easy to sew with quick piecing methods. It's easy to quick piece the little tulip quilt blocks, in part by creating triangles with the same techniques used for one type of quick pieced flying geese, but only on one end of four strips. The two petals cut from a single fabric (unless you are going totally scrappy) have triangular ends that are sewn at different angles. Assembly is the same -- only the orientation of triangular ends differ. All strips with triangles sewn at their ends should be the same size as the original strip after assembly. Draw a diagonal line from one corner to the opposite corner on the reverse side of two 2-1/2" x 2-1/2" background squares. Find the 2-1/2" x 8-1/2" outer rectangle -- the longest rectangle. Refer to the top (Type A) illustration. Align a marked square with the long rectangle, right sides together, edges matched exactly, and the diagonal line stretching from the upper left to lower right as shown. Placing a medium hot iron on the patchwork helps patches stick together, but I recommend that you use straight pins to secure fabric when preparing lots of pieces for chain piecing. Sew a seam directly on the drawn line. Press to set the seam (I don't always say that in instructions, but setting seams is a good habit to develop). Slice through both layers of fabric about 1/4" from the seam (on the side nearest the corner). The long line that overlaps the rectangle/square represents a cut line. Carefully flip what's left of the square right side up to create the end triangle. Press seam allowance either direction. The strip should still measure 2-1/2" x 8-1/2". Find the 2-1/2" x 6-1/2" strip (of a different fabric) cut for the inner petal. Align, sew and trim a square to make another Type A petal. Draw diagonal lines on two more 2-1/2" x 2-1/2" background squares. Find the 2-1/2" X 6-1/2" strip cut from the outer petal fabric. Sew a square to its left end but align, sew, and trim the end as shown for a Type B petal in the middle illustration. Create a second B petal by sewing a 2-1/2" square to the end of the 2-1/2" x 4-1/2" inner petal rectangle. Refer to the bottom illustration left to right as you work. Use a calibrated quarter inch seam allowance throughout. Sew the 2-1/2" x 2-1/2" center bud to the remaining 2-1/2" x 2-1/2" background square. Press seam allowance either direction and then sew the 2-1/2" x 4-1/2" background rectangle to the right-hand side of the unit as shown (the bud square will be bottom left. Sew the shortest B type (inner petal) to the left of the flower bud unit. Sew the shortest A type (inner petal) to the bottom of the patchwork you just created. Press seam either direction. Sew the shortest B type (outer petal) to the left of the tulip patchwork). Press either direction. Sew the remaining A type (outer petal) to the bottom of the little tulip quilt block. Press seam either direction. The quilt block should measure 8-1/2" x 8-1/2". You might want to consider strip piecing techniques for the center bud unit when making lots of quilt blocks. The shorter the strips you use, the more variety you can add to the quilt. Make strip sets by sewing 2-1/2" wide strips together lengthwise. Cut 2-1/2" segments from each set (one per block). Don't forget to square up the end of each strip set before you cut segments.